Joker Poker has many variants. This variant of 52 hands is created by Real Time Gaming. 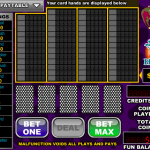 This is the highest paying video poker game available by RTG. 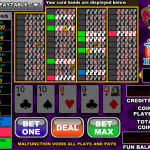 Apart from the usual winning hands, a Sequential Royal Flush pays 10,000 coins. This is on a 5-coin bet. One needs 10, J, Q, K, A in the same order to win this. A Royal in any other order will receive 4,000 coins. However, if that hand was made with a Joker, the player will receive only 400 coins. There is a big jackpot in this game. If you want to qualify for this, you need a 5-coin bet. There is no bonus stage. There is one wild in every deck in this version of Joker Poker. You will be dealt 5 cards, all of them facing up. You can decide whether to hold or discard the cards. The Joker acts as the wild card. This means you can use the Joker to replace any card to create a winning hand. Do note that only the bottom hand shows the starting cards. The winning hands are Kings or better, two pairs, three of a kind, straight, flush, full house, four of a kind, straight flush, Joker Royal Flush, 5 of a kind, Natural Royal Flush. Apart from these hand, there is also the Sequential Natural Royal Flush. You will need 10, J, Q, K, A to be dealt in the same order which will get you a win of 20,000 coins. Each hand uses a 53-card deck consisting of a Joker. Every hand consists of the same held cards as the bottom hand. You will need to draw in order to be dealt the remaining hands. Joker Poker’s 52-hand variant is a great game. It is also the best game if you are looking out for games having a higher payout rate. 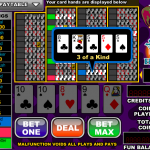 For another great and engaging game you should consider playing Joker Poker – 3 Hand by RealTime Gaming.